O Boy! O Boy! O Boy! My latest custom order ~ 3 crosses for baby boys. 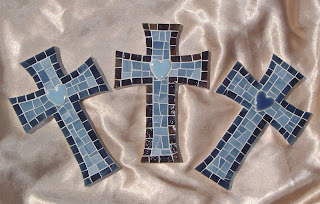 These mosaic crosses were created on my 4" x 6" cross base. They each have a navy blue border, a heart tile and a light blue background. I love that, even though they are similar, each cross is unique. I pray that these crosses will be a blessing to the sweet little boys for years and years to come. Ornaments . . . in March? I completed a custom order this week . 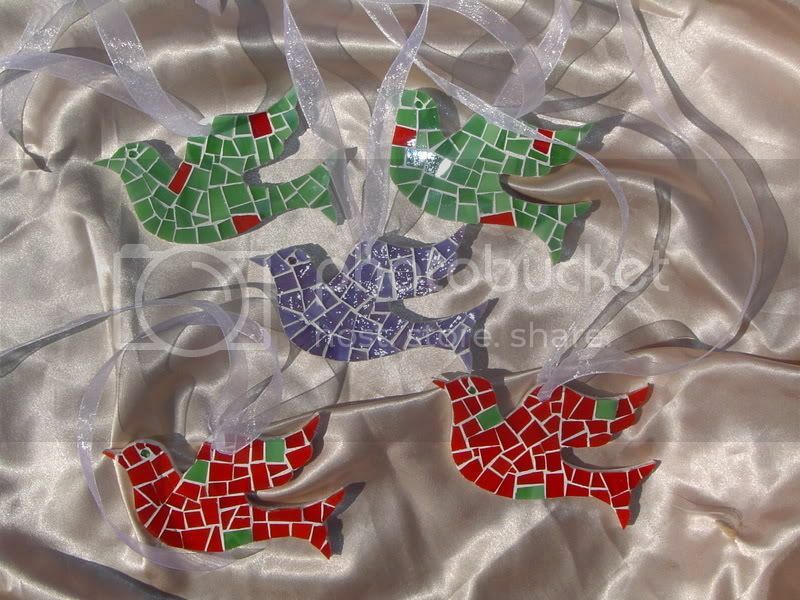 . . 5 mosaic dove ornaments. Yep ~ Christmas ornaments in March. These doves were custom ordered by a wonderful, extremely patient client. I have had the pleasure of working with her to create a custom mosaic cross, angel ornaments and now dove ornaments. She is thinking about ordering cross ornaments for this Christmas and I'm looking forward to hearing what she has in mind. I make a limited number of ornaments every year. I enjoy making them but they are time consuming because of their small size. It can be tricky and time consuming to cut tiny pieces of glass to fit onto the small surfaces. I usually spend more time on an ornament than I do on a 4" x 6" cross. Crazy but true. 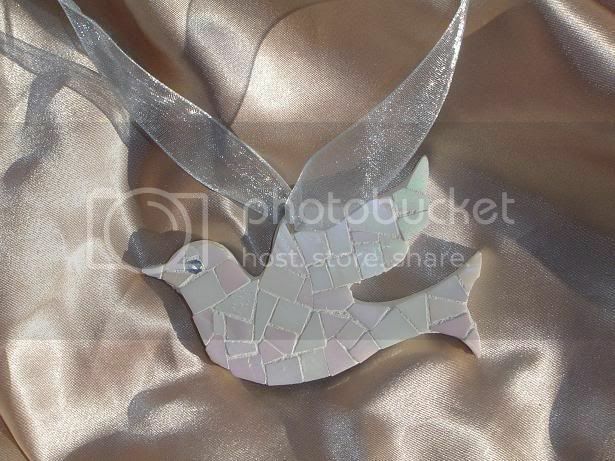 I have only made one other dove ornament and I used white iridescent glass. One of my goals is to create ornaments for a Chrismon tree using all white iridescent glass and a white dove will definitely be included. 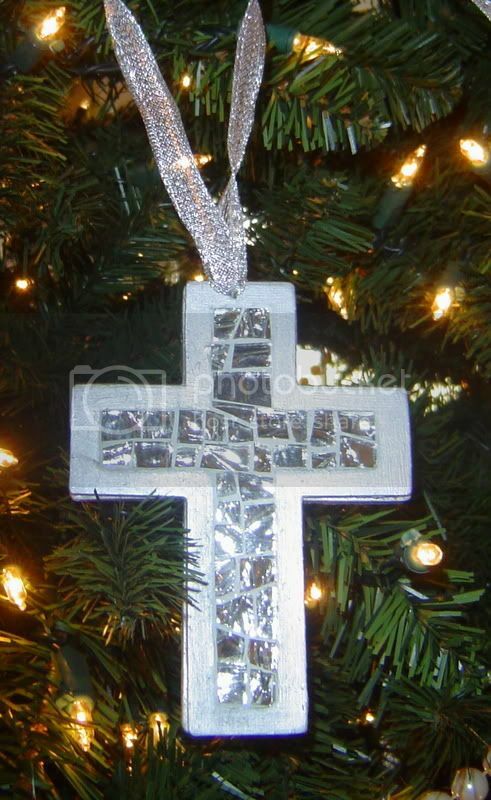 Another ornament that I'll include on the Chrismon tree is a cross. I made this one, using silver mirror Krinkle glass, for my mom for Christmas last year. This isn't the greatest picture but the ornament was so pretty on the tree. And ~ of course ~ I make lots and lots of angel ornaments. You can see the different types of angels and find out more info about them on the Angels page of my website.